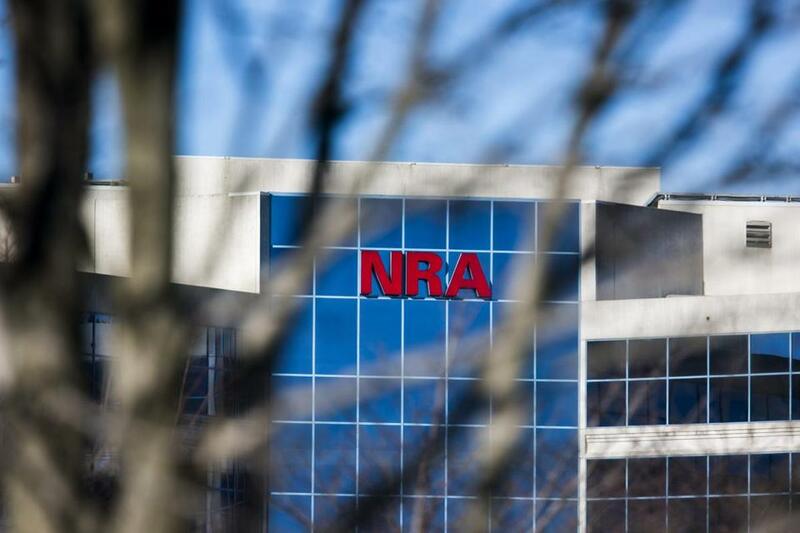 The National Rifle Association’s headquarters in Fairfax, Va.
WASHINGTON — Parkland. Pittsburgh. Vegas and Sutherland Springs. They have become shorthand for mass shootings, and for the predictable partisan gridlock that followed. But the midterm elections Tuesday could show a weakening of the gun lobby’s grip on US politics, with Democrats in key districts openly campaigning on the issue of gun control, some Republicans in retreat, and the NRA hamstrung financially. “What you’re witnessing is a sea change in our politics,” said Peter Ambler, executive director of the gun control group founded by former congresswoman Gabby Giffords, who was shot in 2011. The sheer number of mass shootings appears to have an “additive affect” over time, Ambler argued, with voters unaffiliated with the NRA caring more about guns. The NRA’s spending on the midterm elections is less than half its total in 2014, according to an analysis by Bloomberg News. It had just $1.48 million in unrestricted assets at the end of 2017 — down from $65.6 million two years before. And there is some evidence gun politics is changing in a few key House districts. In Michigan, Republican Representative Mike Bishop’s “A/A+” rating from the NRA was removed from his campaign website soon after the shooting earlier this year at Marjory Stoneman Douglas High School in Parkland, Fla., reignited a national debate on gun violence. “The NRA is not an issue for me,” Bishop told the Detroit News. GOP Representative Mike Coffman, who represents Aurora, Colo., where 12 people were killed in a shooting at a movie theater in 2012, has been heavily criticized for his high marks and donations from the NRA. Polls show he is among the most vulnerable House Republicans. Another House Republican, Brian Mast of Florida, shocked GOP colleagues when he called for discussion of an assault weapons ban after the shooting in Parkland, which is near his district. In another Florida district near Parkland, Republican Carlos Curbelo has so embraced gun control issues that former New York City mayor Michael Bloomberg’s gun control group Everytown endorsed him over his Democratic rival. The Democrat, Debbie Mucarsel-Powell, also supports gun control and has run ads linking her position to her father’s death due to gun violence. The NRA scrubbed its site of previous years’ ratings for members of Congress. One NRA staff member told The Washington Post that “enemies” were using those past grades against them. Gun control advocates are giddy at the change in the political dynamic. “What used to be a badge of honor is now a scarlet letter,” said Shannon Watts, founder of another Bloomberg-backed gun reform group, Moms Demand Action. The NRA’s approval rating took a nosedive as well, especially among white women. According to a NBC/WSJ poll from March, just 37 percent of people viewed the organization favorably, down from 45 percent the year before. It was the first time since 2000 the poll found the NRA’s unfavorable rating was higher than its popularity. The organization is also on the defensive over the Russia investigation. In July, the Justice Department arrested a Russian national and lifetime NRA member whom the FBI accused of infiltrating the gun rights groups to help the Kremlin influence US politics. Some Republicans see a changing dynamic. The mass shootings have also catalyzed a new crop of candidates. Jennifer Longdon, who was paralyzed in a random drive-by shooting, is a Democrat running for a state House seat in Arizona. She cites the shooting in her campaign as an example of how she’s conquered adversity. Tom Sullivan, whose son was killed in the Aurora shooting, is running to unseat a Republican in a Colorado state House district. The Republican, rated “A” by the NRA, recently cosponsored a “red flag” bill allowing judges to prevent people from accessing firearms in extreme situations. On the national level, Lucia McBath in Georgia is the gun advocates’ biggest play, running in the well-heeled suburban district outside Atlanta against GOP Representative Karen Handel. McBath’s son was shot to death in 2012 for playing his music too loudly at a gas station. She’s running unabashedly on changing gun laws, and Everytown has spent $3.7 million on ads for her. Handel has been quiet on gun issues, her NRA “A” rating absent from her campaign website. Republican strategists say the current climate may not last. “You can chalk it up to election-year jitters,” said Michael Barnett, chair of the Palm Beach County Republicans. Barnett predicted the GOP posture on the Second Amendment would “revert to normal” after the elections. Indeed, the NRA’s support still counts for Republicans in deep red territory. In the West Virginia Senate race, the NRA ran an ad touting its “D” rating for incumbent Democrat Joe Manchin and suggested he would take gun rights away from his constituents. The NRA also attacked other Senate Democrats in red states, including Heidi Heitkamp in North Dakota and Joe Donnelly in Indiana.